Product prices and availability are accurate as of 2019-04-21 12:55:37 UTC and are subject to change. Any price and availability information displayed on http://www.amazon.com/ at the time of purchase will apply to the purchase of this product. 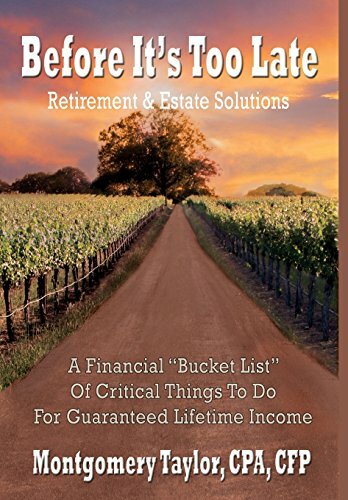 Author Bookstand is proud to offer Before It's Too Late: Retirement & Estate Solutions by Bookstand Publishing. Bookstand Publishing offers books by the best indie authors throughout North America and the world. Bookstand Publishing is dedicated to offering original content to a broad audience and promoting great authors, literacy, and freedom of expression. Before It's Too Late: Retirement & Estate Solutions has generated a lot of interest and excitement and we think it would be an excellent addition to your library. Wouldn't it be great if you could get your various financial resources working together in a wise integrated fashion? Wouldn't it be even more amazing if you learned that you didn't need to pay off your mortgage in order to live comfortably in retirement? And wouldn't it be over the top if you could find a way to be certain about not running out of money in retirement? Sound too good to be true? Welcome to a new approach to planning for retirement and leaving a legacy. 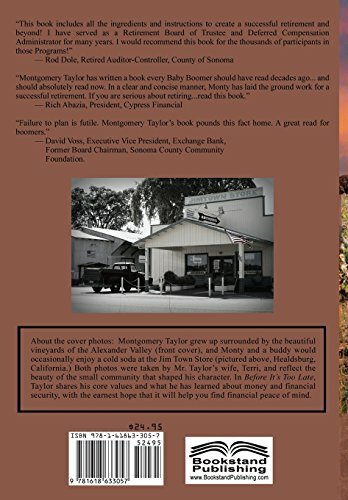 The time has come for you to read financial author Montgomery Taylor's explosive new book, BEFORE IT'S TOO LATE. 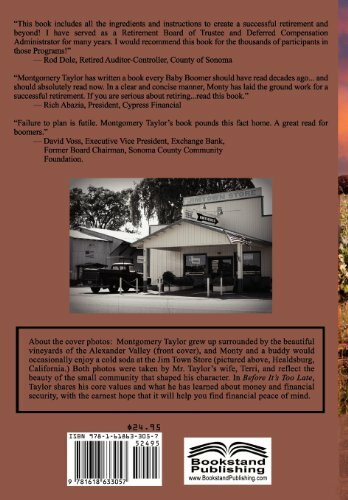 Regardless of whether you're retiring in the next decade or already retired, Taylor's well-researched financial strategies will have you rethinking your old retirement plan. With financial expert Montgomery Taylor as your advocate, you'll learn some totally unexpected methods for achieving the security you want: Learn how to construct your own pension for lifetime income, and make it better than the pension your father or grandfather had. Learn how to cover long term care expenses at a fraction of the cost -- without traditional LTC insurance. Learn how to protect yourself from the hazards of putting your child's name on your bank account or house deed -- very common but serious mistakes. Learn how to position yourself so that you could pay off your mortgage anytime you want -- but strategically choose not to. Learn how to dramatically increase your spendable income, even when it looks impossible. 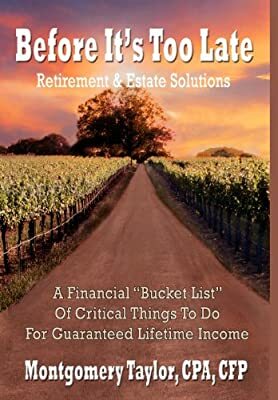 With clear language and a wealth of fresh ideas, this book presents the financial "bucket list" of critical things to do for guaranteed lifetime income. No baby boomer should retire without checking this list -- read this book and enjoy your best years while securing your financial future for yourself and your loved ones. 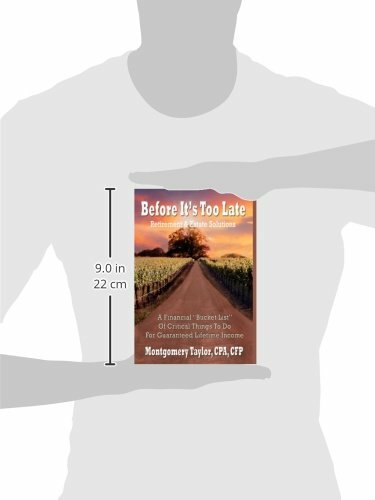 There are lots of books on retirement and estate planning -- but this one is different! Say "Yes" to retirement peace of mind Before It's Too Late.